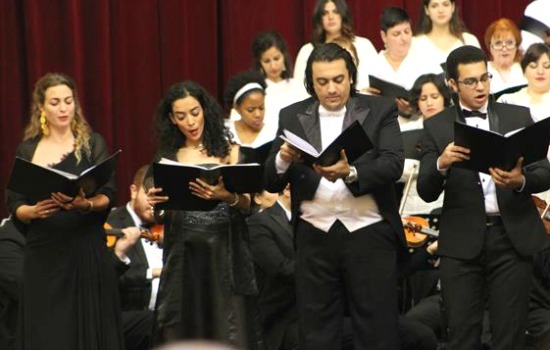 As per their annual tradition, the Cairo Choral Society and the Cairo Festival Orchestra, conducted by John Baboukis, are adding their share to the season’s Christmas cheer, which will slowly but surely take over Egypt’s music scene with carols and compositions linked to the Christian tradition. The choir, which operates under the umbrella of the American University in Cairo (AUC) and its Performing and Visual Arts (PVA) Department, gave two concerts: on 7 December at the Malak Gabr Arts Theatre (AUC New Cairo); and on 8 December at the Ewart Memorial Hall (AUC Downtown). The evenings opened with Mozart’s Eine kleine Nachtmusik, one of the composer’s best known lighter works, often incorporated into easy-listening compilations. Following the serenade, the choir moved to Schubert’s Mass in G, alongside Mozart’s four motets: Sancta Maria, mater Dei, KV 273; Alma Dei creatoris, KV 277; Laudate Dominum (from Vesperae solennes de confessore, K. 339); and Veni sancte Spiritus, K. 47. The evenings included four soloists: soprano Virginie Foucard, mezzo Nouresta El Marghany, tenor Amr Medhat and bass George Gamal. Over its long and rich history, the choir’s common practice was to give at least one of the concerts outside the university. Many of them used to take place at the All Saints’ Cathedral in Zamalek, a venue which despite weak acoustics, has the natural power to add a unique devotional aura to compositions touching on spirituality. We can still remember the performance of Schubert’s Mass in G back in 2011, when the choir formed a much larger group not dominated by women’s voices. This year’s concerts revealed a smaller number of singers and lacked the important coating of male voices. But, to omit analysis of the artistic elements themselves, let us look at conceptual choices made by the choir’s music director and principal conductor, John Baboukis. Repeating its practice from 2011, about which I wrote on those pages, this time the Cairo Choral Society did not separate Schubert’s Mass from Mozart’s works. It used the motets as an integral structural component of Schubert’s work, inserting them in between the mass’s movements. The programme notes offer a detailed explanation of what triggers the musical proceedings. We learn that “such music was meant to be performed in church, as part of service worship. Today the normal practice is to perform all five mass movements one after the other, without a break in between, as though the work were a sort of choral symphony. This is not how the music was actually presented in a church service. It is probably “the setting for which the composer created it” that prompted me to revisit the topic, time and again, through the history of The High Mass, the Latin Eucharistic service with a history spanning many centuries. Having evolved through the centuries, the mass’s structure took its so-called final format in 1570 when, based on the decision of Pope Pius V and the Council of Trent, the liturgy had to incorporate fixed texts and rites performed in a particular sequence, known as “The Order of Mass” to be respected by the entire Roman church. As follows, the Tridentine (from Latin term for Trent) liturgy consists of two major intercalated segments: the Proper (the psalms, prayers, readings, etc.) and the Ordinary, which has five sung parts of the liturgy: Kyrie, Gloria, Credo, Sanctus, Angus Dei, topped with the closing Ite, missa est. In the Cairo Choral Society’s concert, Baboukis used Schubert’s Mass in G as the Ordinary and Mozart’s motets as inserts in place of several segments of the Proper. For example, between the Ordinary’s Gloria and Credo, the Proper consists of several elements, minor compositions sung or recited by the congregation, soloists and small choir, as well as prayers and readings. In this segment of the mass, the Proper consists of Collects, Epistle, Gradual, Alleluia and Gospel, all forming the Liturgy of the Word. After Credo, the Proper continues with Offertory, Secret and Preface (segments of the Liturgy of the Eucharist) followed by Sanctus, again a segment from the Ordinary, and so on. The complete Eucharistic service could last up to two, even three hours. In the 16th century, and particularly following the Tidentine’s instructions, the composers remained faithful to the holy requirements. However, as humanity, music and creativity progressed, those rules became limitations that started being stretched.For instance, musicologists suggest the Mass in B minor by Bach (1685-1750) was created with the intention of being performed in its entirety: all segments of the Ordinary to be performed without interruptions from the Proper. Commissioned by Prince Esterhazy, the masses by Haydn (1732-1809) were in fact composed for the settings of the palaces and performed in their entirety, even those that premiered at the small church that belonged to the Esterhazy family. Beethoven’s Mass in C major (1807) also premiered outside the traditional church service setting. A year later, he conducted Gloria and Sanctus only from the Mass in C major, as the opening segment of a concert that was to feature Symphonies No. 5 and 6, Piano Concerto No. 4 and Choral Fantasy. His Missa Solemnis premiered in 1824 in St. Petersburg as a charity concert. Later that same year, three parts of the mass – Kyrie, Credo, and Agnus Dei – were performed during a concert that featured the premiere of the Symphony No. 9. When Franz Schubert (1797-1828) stepped into the game, the world of music had been going through many great shifts in philosophy which influenced the whole of humankind and were reflected in creative endeavours. In this new world, already for a few decades the church had not served as the only location for the performance of sacred works. Neither should we ignore the fact that Schubert’s lifestyle was far from an exemplary devotee’s. Tormented by questions regarding God and salvation as promoted by the church this unfortunate yet prolific composer, whose short life had to end for the world to recognise his genius, composed many sacred works out of the obligation to fit to the expected norms and earn a living. In fact, his Mass in G was not even driven by devotion, but his need to prove himself as a responsible candidate for Therese Grob’s hand – a mission he failed to achieve. “I loved someone very dearly and she loved me too. She was a school master’s daughter, somewhat younger than myself and in a Mass, which I composed, she sang the soprano solos most beautifully and with deep feeling. For three years she hoped I would marry her; but I could not find a position which would have provided for us both. She then bowed to her parents’ wishes and married someone else, which hurt me very much,” Schubert wrote to his friend Anselm Huttenbrenner. To top up the pressures, the 31 years of Schubert’s life unfolded at a time when everyone still remembered Mozart, especially through Antonio Salieri (1750-1825), Mozart’s bitter rival and Schubert’s teacher; everyone lived in the shadow of Beethoven (1770-1827). It was a time of individuality regained, with growing competition over the ability to make one’s mark through the established canons. It was in such conceptual and historical settings that Schubert composed his Mass in G. If not for its musical beauty and richness, then for the conceptual setting of the time, the Mass in G deserves to be listened to and enjoyed in its entirety. Through the centuries, composers had many dreams and ambitions, yet they no doubt all shared the same hope, which was to make an imprint in human history, to move music a step further and have their name remembered. One wonders what Schubert would have thought, and whether he would’ve approved, of his work being truncated by Mozart’s compositions. The exercise definitely shakes our comfort zone and as audience, we might fear experiments especially when they affect the established canons. While some audience members might welcome this approach to Schubert’s Mass in G, others might ask justified questions, generated by their own experiences and expectations. In this thought provoking experience, one can wonder how far we can experiment with music, knowing that this experiment cannot really meet its purpose which is to put the music in its original setting. Taking into account the historical background and the composer’s own life, is Schubert’s Mass the most successful material through which we can revisit the musical and historical importance the Tridentine’s pact? And, more importantly, what choices are the best for the sake of music and how do they benefit the reading of the composer and his work; how do they move the music forward, adding to the creative journey the composer strived for? In 2011, I wrote about a very similar Schubert-Mozart experiment. Five years later, the experience still remains interesting food for thought, even if it leaves me with more questions than answers.